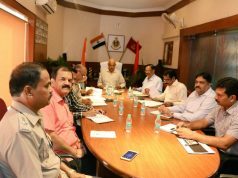 Bhubaneswar: After over 220-mm rainfall in less than 18 hours, the entire workforce of Team BMC sprung into quick action helping the deluged city emerge out of the watery grief, as the incessant rains have created a calamity-like situation in and around the State Capital. The quick action was carried out in collaboration with the Odisha Fire Services. To understand the severity of the situation if one takes only the BMC area of 135 square kilometre within the State Capital into account, then the rainfall have poured in a mammoth 3,000 crore litres of water or more into the city, which, created a havoc in the drainage network as the excess water was more than the natural carrying capacity of the 10 drainage channels, which carry the storm water via Gangua Nullah to the nearby Daya river. 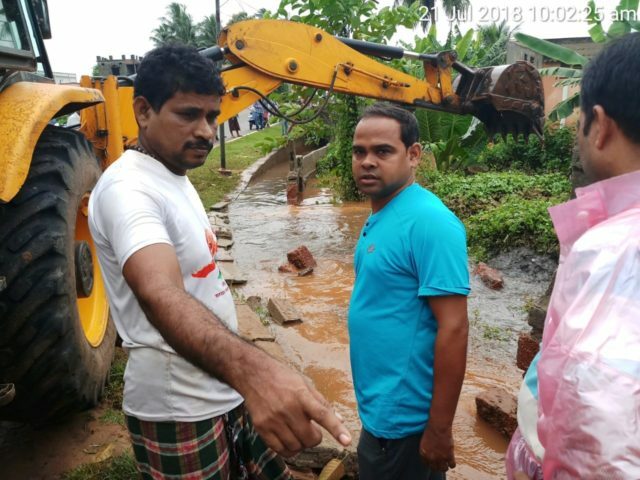 Team BMC consisting 40 engineers, 13 nodal officers of each sub-zones with their respective team members, three sanitation agencies with 1,050 (sweepers, project ordinates and supervisors), five JCBs, 2 proclain machines, 5 cesspool vehicles, 30 pumps to dewater water-logging pockets (20 from Fire Services and 10 from BMC) were deployed with dedicated follow-up mechanism through the Storm Water Control Room. The Storm Water Control Room (0674-24382281) today received 121 complaints by 6 pm. Similarly, the Bhubaneswar One Helpline number 18003450061today received more than 100 complaints till 6 pm. Many were repeated calls made by affected people to the newly-opened Bhubaneswar Operations Centre at the Smart City Office in BMC-Bhawani Mall. Team BMC today received complaints of obstructions in 68 places across the city. Different teams of BMC took quick actions to manage release of rain water at Ward No. 25 near petrol pump, Baliapata Basti in Ward No. 19, LIC Colony Ward No. 38, Dhirikuti Basti Ward No. 12, Padmavati Vihar in Ward No. 6, Aditya Enclave Patia in Ward No. 3, Sriram Nagar Lane Number 19 in Ward No. 59, Patadei Basti Semigadia Ward No. 5, drain de-silting at Khimji Lane, near Sani Temple in Ward No. 37, near ISKCON Temple in Ward No. 25, Paika Nagar and Radhakrishna Lane in Ward No. 37. Team BMC also visited the Daya West Canal with the Superintending Engineer and Executive Engineer of Water Resources Department. 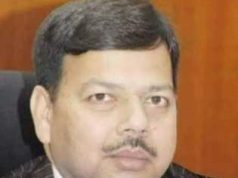 The Water Resources Department has assured to tahe up cleaning of the canal from tomorrow. The operations will continue tomorrow and day after as the Indian Meteorology Department (IMD) has predicted more rains in next 48 hours. The holiday on Sunday for Bahuda was cancelled today and everyone was asked to be present at office as the emergency situation is likely to continue. Odisha Fire Services personnel rescued 450 persons from 13 locations across the city. While rescuing the affected persons in three localities, the Fire personnel have to use boats. Fire Services personnel conducted de-watering work at 46 places in the city. The major locations are: Gaouri Garden, Gauri Nagar, Shriram Nagar, Mallik Complex Jagamara, Paika Nagar near Delta Square, Passport Office locality, Jayadev Vihar, Nayapalli Ekamra Road, Ghanasyam Apartment, Nilamadhaba Basti, Khara Khia Baidyanath, Chakeisiani, Anni House Chhak, Laxmi sagar Chhak, Adhei Kuala, Basnta Villa, Jagamara Lane-4 across the city. Odisha Fire Service officials apprehend more calls likely to come as calls were still coming after 6 pm in the evening.